The U.S. ethanol industry set a new production record the week ending Dec. 1, with production averaging 1.108 million barrels per day, according to data published by the U.S. Energy Information Administration. Noble Group Ltd. has announced a new buyer of Noble Americas South Bend Ethanol LLC, a subsidiary that owns and operates an ethanol production plant in South Bend, Indiana. Noble currently plans to sell the facility to Mercuria Investments US Inc. 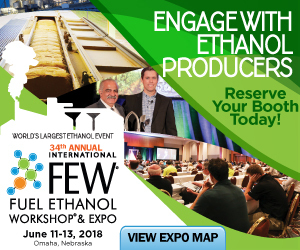 The U.S. EPA has approved efficient producer pathways from several U.S. ethanol plants. A second round of funding has been announced for the U.S. Department of Energy’s Small Business Innovations Research and Small Business Technology Transfer programs for 2018. JGP Energy Partners, a joint venture between Green Plains Inc. and Jefferson Energy Companies, loaded its first vessel with nearly 3 million gallons of ethanol destined for Brazil Dec. 4. The newly constructed terminal is located in Beaumont, Texas. The Federal Trade Commission has released its 2017 Report on Ethanol Market Concentration, finding that concentration is substantially unchanged from a year ago. The report also notes that ethanol capacity increased for the fourth consecutive year. Syngenta has partnered with Green Plains Inc. to expand its use of Enogen corn enzyme technology across its 1.5 billion gallon production platform. Enogen corn contains alpha amylase enzyme and helps reduce viscosity of the corn mash. Vivergo Fuels has shut down its U.K.-based ethanol plant in response to legislative uncertainty. The company cited falling ethanol prices and a constrained ethanol market resulting from government inaction as contributing to its decision. East Kansas Agri-Energy of Garnett, Kansas, and Pearson Fuels of San Diego, California, announce the signing of an exclusive West Coast marketing agreement for the distribution of renewable diesel from EKAE’s recently commissioned plant in Garnett. Sen. John Barrasso, R-Wyo., chairman of the Senate Committee on Environment and Public Works, is asking the U.S. EPA to complete studies assessing the impact of the Renewable Fuel Standard on air, water and land quality. Thirty-nine students from Sibley East High School in Arlington, Minnesota, toured Winthrop's Heartland Corn Products on Nov. 14 to gain a better appreciation and understanding on local renewable fuel production. Propel Fuels recently announced new research has shown that low carbon liquid fuels must play a more significant role to meet California’s 2020 and 2030 carbon reduction goals under the Low Carbon Fuel Standard. The U.S. EPA approved an efficient producer petition by Homeland Energy Solutions LLC for a fuel pathway at its production facility in Lawler, Iowa. The facility achieves a 26.1 percent GHG reduction when compared to baseline gasoline.